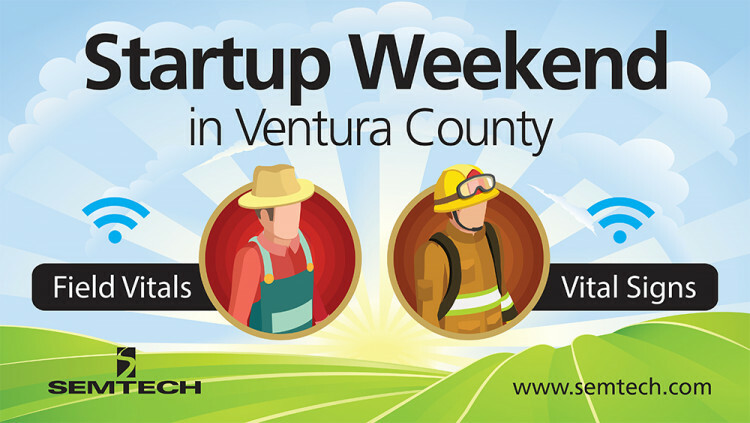 CAMARILLO, Calif., May 4, 2017 – Semtech Corporation (Nasdaq: SMTC), a leading supplier of analog and mixed-signal semiconductors, announce the integration of its LoRa® devices and wireless RF technology (LoRa Technology) and LinkCharge™ in projects developed at the second annual Startup Weekend Ventura County on April 21-23, in Camarillo, Calif. The event focused on providing solutions to healthcare and agricultural challenges specific to the region, as well as stimulating the area’s startup community. Semtech’s LinkCharge wireless charging platform provides a range of solutions to enable wireless power in next-generation products for consumers, infrastructure and industrial applications. It includes the LinkCharge™ 40 Series, the LinkCharge™ 20 Series and the LinkCharge™ CT (counter top), an out-of-box-ready infrastructure wireless charging system for use in public, enterprise and consumer settings. The LinkCharge platform is compatible with the major industry standards ensuring end products can quickly charge any wireless charging-equipped device even as the industry adoption continues to grow and evolve. More information about LinkCharge platform and the rest of Semtech’s wireless charging solutions is available at www.semtech.com/wireless-charging.